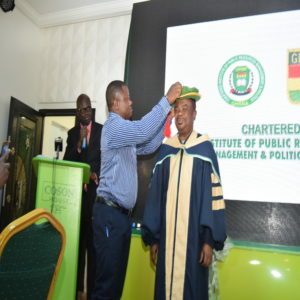 The ultra-modern COSON Arena located within the magnificent COSON House in Ikeja was on Monday June 25, 2018 filled to the brim as friends, family and well-wishers gathered to celebrate COSON Chairman, Chief Tony Okoroji who was on the day honored by the Chartered Institute of Public Resources, Management and Politics of the Peoples Republic of Ghana. Speaking at the event, Dr Richards Ikpada – Kpoku, Executive Director of the Institute, said ‘‘We are here on this auspicious state visit on behalf of the Advisory Board and Governing Council to confer and honor one of Nigeria’s transformational leaders, a first class corporate technocrat of international repute and a most patriotic Nation builder, Chief Tony Okoroji with a prestigious Lifetime Senior Fellowship Recognition Award following his impressive and enviable track record as a legendary, greatly accomplished public service personality and resourceful statesman who has made tremendous contributions towards national development for the progress, peace and unity of One Nigeria and the African continent. 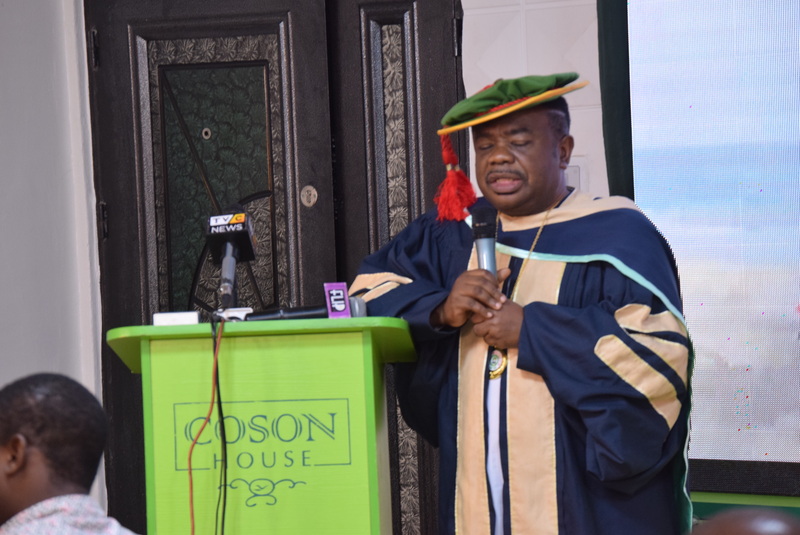 Receiving the award, the COSON Chairman, Chief Tony Okoroji expressed his gratitude to everyone present at the arena and to the fellows of the institute for such an honor stating that he was truly humbled to be honored with such a prestigious award. 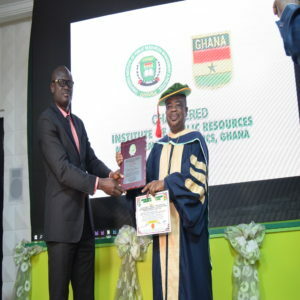 Chief Tony Okoroji was then inducted into the institute’s 2018 Fellowship Hall of Fame. It will be recalled that in May, 2018, Chief Okoroji was honoured by Lagos State University (LASU) with a special award presented to Okoroji by LASU Vice Chancellor, Prof. Olanrewaju Fagbohun. In February, Chief Tony Okoroji who last year was presented by Nigeria’s City People magazine with the “Pillar of Entertainment in Nigeria” award was bestowed with the prestigious “Africa’s Patriotic Personality Award”, by the League of African Development Students (LEADS Africa) – an umbrella body of democratic Students Unions from different countries in Africa. In April, 2018, the COSON Chairman bagged an Award of Excellence for his outstanding leadership in the Entertainment Industry from the Edo State Chapter of the Performing Musicians’ Association of Nigeria (PMAN) which award was presented by the state PMAN Chairman, Comrade Willy Eghe Nova. Almost from every direction, Chief Tony Okoroji’s unassailable contributions and achievements of several years of unbroken service to national and international development is receiving great accolades.